I’m sold. On a whim, I send a direct message to @GetStoried requesting more information. For all I know that’s the end of it. Minutes later my phone rings. Wouldn’t you know, it’s Michael Margolis, the force behind GetStoried. In the midst of chaos, we talk. And, it’s like we’re old friends. Our ideas mesh, there’s good energy, and so it begins…my joining the team for what is going to be an amazing event. 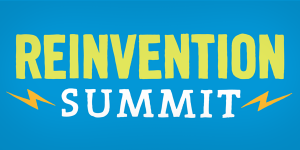 The Reinvention Summit is designed to move participants into the world of possibility. As a huge believer in the power of story, I am grateful to have crossed paths with @GetStoried and to be a part the Reinvention Summit team. I encourage you to visit www.reinventionsummit.com to to sign up. Reinvent your story and join us as we re-story the future. Sounds perfect for my new role as storyteller for the Chesapeake Bay. Count me in! Thanks, Kristy & Randy! You’re two of the best storytellers I know!